Moments of Life (MOL), which bundles relevant government services, across different agencies, to the citizen at key moments of his life. This reduces the need for citizens to transact with multiple government agencies, for a more seamless and convenient experience. The first three had been identified as areas of focus earlier in the year, as seen in this Speech by Dr. Vivian Balakrishnan, Minister for Foreign Affairs and Minister-in-Charge of the Smart Nation initiative and this interview with Dr. Janil Puthucheary, Senior Minister of State, Ministry of Communications and Information & Ministry of Education and Minister in-charge of GovTech). Smart Urban Mobility and Moments of Life have been added in the immediate focus areas in this update. The current National Registration Identity Card (NRIC) system is primarily analogue, a card which people carry in their wallets containing personal information, information which resides in government databases. The government wants to create a secure digital identification system and have the infrastructure made available not just for government, but the private sector as well. As a first step, the government launched a pilot in May with four banks to enable people to use their registered profile on Singapore government’s MyInfo service to apply for new bank accounts. The use of MyInfo will be extended to more government and private sector services. The use of a SingPass mobile soft token, instead of hard token/ SMS OTP (Singpass provides a gateway to hundreds of e-services provided by more than 60 government agencies) for authentication and authorisation is also being explored. A mobile soft token would eliminate the need for hardware tokens or even one-time passwords received through SMS. The NDI framework is expected to be operational within around three years. There will also be trials for digital signatures to facilitate paperless transactions. 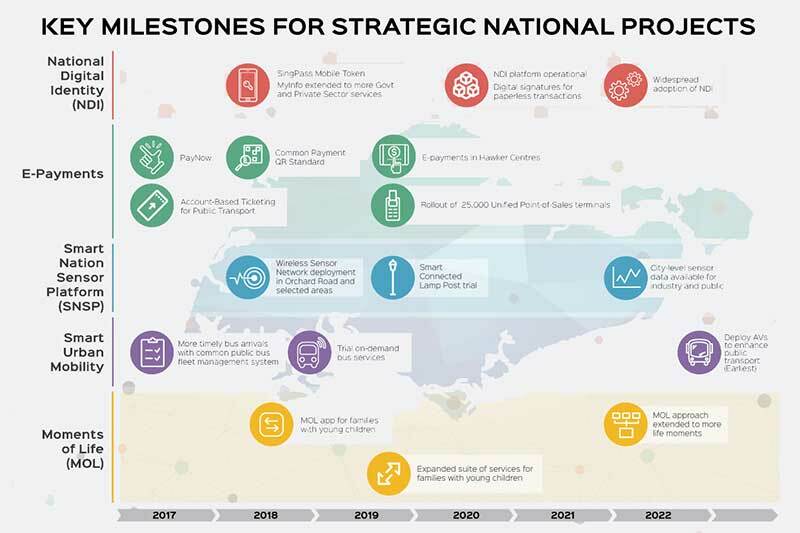 Multiple initiatives (click here for a snapshot of all the initiatives) have been announced to boost e-payments, such as the launch of PayNow by the Association of Banks in Singapore (ABS) in July and the extension of the Account-Based Ticketing pilot by the Land Transport Authority (LTA). The LTA and TransitLink announced that they aim to have fully cashless public transport system by 2020. Future steps include a common QR payment standard, introduction of e-payments in hawker centres and rollout of 25,000 Unified Point-of-Sales terminals. All 110,000 lamp posts in Singapore are being converted into an interconnected network of wireless sensors, under the SNSP project. The graphic shows the deployment of wireless sensor network in Orchard Road (one of the main shopping districts in Singapore) and other selected areas in 2018. City-level sensor data could be made available for industry and public use by 2022. The first area highlighted under Smart Mobility is to ensure more timely bus arrivals with common public bus fleet management system. Then the LTA recently announced trials of on-demand, dynamically-routed public bus services to create a public bus service that optimises its route and schedule based on real-time commuter demand. This is a two-phase trial to go on with the actual trial happening in the second half of 2018, after modelling, simulation and testing and calibration of hardware and software solutions. The deployment of autonomous vehicles for public transport will happen earliest by 2022. Government service delivery revolving around moments of life has become a cornerstone of digital transformation for many governments around the world. For example, New Zealand has SmartStart, a cross-agency initiative that gives parents easy online access to information, services and support during pregnancy and baby’s first years. The first initiative in the area, as seen in the graphic, is an app for families with young children, with the suite of services to be expanded later. The government plans to extend the MOL approach to more life moments by 2022.